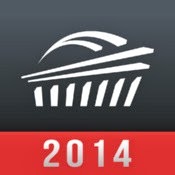 All Major League Ultimate teams have posted their 2014 rosters. Each team indicated which players were "rookies" within their published roster. 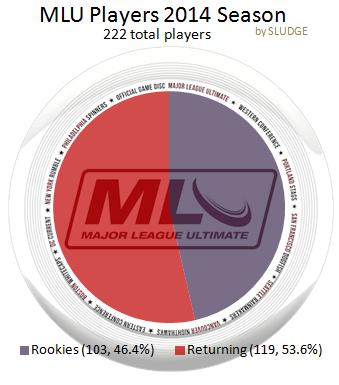 Out of 222 MLU players, 46.4% (103) are "rookies" (new MLU players) in MLU's 2nd season. 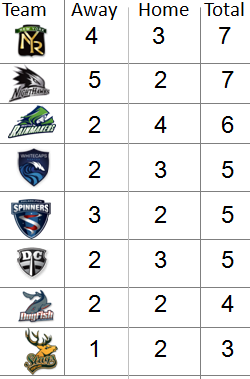 Nearly half are playing in the MLU for the first time. 222 rostered players. 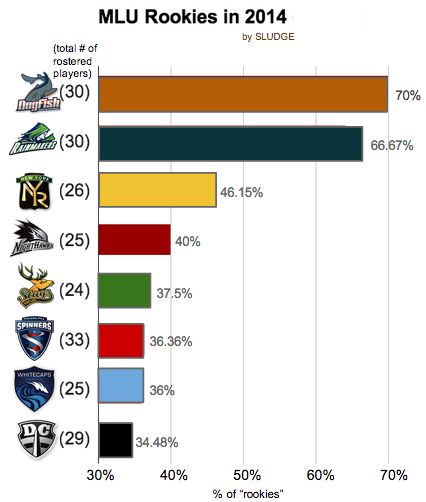 Nearly 50% are first-time players in the MLU. Major League Ultimate released their broadcast schedule for the 2014 season. For MLU's regular season, 21 total games will be streamed live via YouTube for no charge. Again, you will be able to view 20+ professional Ultimate games for FREE. New York Rumble games and Vancouver Nighthawks games will be featured the most with 7 out of 10 regular season games (70%) scheduled to be broadcast. Portland Stags will be on MLU Live the least with only 3 games. UPDATED [3/28]: Added another chart based on supplemental data via Dan Vogel. MLU Live is scheduled to show all Vancouver's away games (5), and only 1 of Portland's away games. Seattle, Boston, and DC games are scheduled to have more home games than away games on MLU Live. 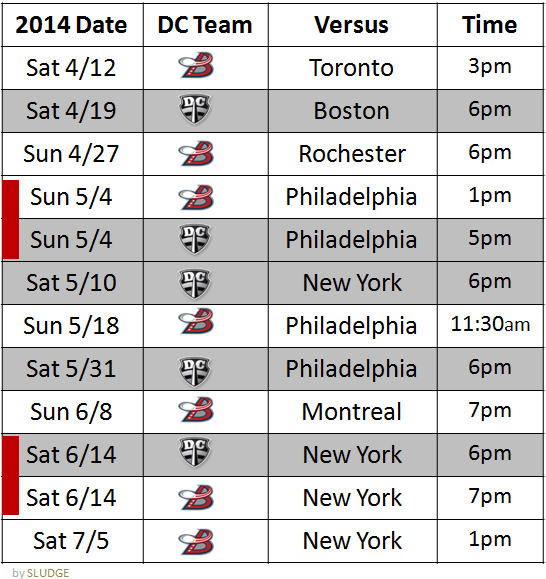 After two tryouts, the 2014 DC Breeze roster was finalized. Sarah Itoh, from the 2013 USAU Championship team DC Scandal, discussed her experience at their February 22nd tryout and her thoughts on if she were to play pro. SLUDGE: You're becoming a pro at these pro Ultimate team tryouts. Tell me about your decision to sign-up for the DC Breeze tryout. Sarah: I knew I would be going to this tryout when I had decided to go to the DC Current tryout, which was a few weeks earlier. The DC Breeze didn't reach out to us [Scandal] about trying out like the Current had. It was really something I just wanted to do, and going alone didn't bother me in any way. SLUDGE: Did you try to recruit other Scandal players to join you? Sarah: I decided to leave everyone alone since most of us knew about the tryout and I figured if anyone was interested, they would be there. By that point I had already sent the team a barrage of e-mails in my attempt to get more of us to tryout for the DC Current, so I didn't want to bug anybody about it any further. Like I had mentioned previously, it was hard to get a lot of interest because it's the club off season and being a fairly late decision on our part, it really didn't allow us enough time to show up physically and mentally prepared. I'm sure a lot of the guys at the tryout had been waiting and working toward that moment since last year's tryout. SLUDGE: What was it like to see Dutchy as a coach for a team other than Scandal? Sarah: I think Dutchy was aware that I might show up. I had expressed my interest in trying out for the Breeze in a group setting, and I believe Dutchy was present, but it was never a topic of discussion between us. I was happy to see Dutchy there, coaching for the DC Breeze. It was a nice reminder of all of his accomplishments as a player (Revolver) and coach (Team USA). SLUDGE: So, what were your goals for participating in the Breeze tryout?? Sarah: I did not expect to make the team. I really only had one goal in mind and that was to try my best, and I think I accomplished that goal. SLUDGE: What concerns would you have if you played for a pro Ultimate team in 2014? Sarah: Well, I would probably be constantly concerned over my ability and athleticism in keeping up with the guys and the game. I'm kind of a slow learner when it comes to Ultimate (and a lot of things) (laughs), and I am definitely not as fast as most of the guys that were at the tryout. So, in terms of the bigger picture let's say, as a woman, I made a pro Ultimate team. It'd be a pretty unique and notable situation within the Ultimate community, so I think there would instantly be a lot of pressure to perform well, and to do so all the time. SLUDGE: When participating in a tryout like this, do you feel any pressure of representing more than just yourself out there on the field? Sarah: Yeah, I'd be lying if I said I didn't. As the only woman there I was definitely compelled to perform well, and as a player from Scandal having just won a national title, I really didn't want to look bad by turning discs over or dropping catches, etcetera. SLUDGE: Did you feel better prepared for the DC Breeze tryout? Sarah: I felt better prepared for the DC Breeze tryout than I had for the DC Current tryout. I had a few more weeks to train and I made sure to get out and run around as much as I could, whether it was indoor Ultimate, winter league, or indoor soccer. The big difference between the tryouts was that the Breeze conducted them outside, on a full turf field. So, the space was nice and I also really appreciated not having to wake up at 3:30 am for this one. SLUDGE: What surprised you most about the Breeze tryout? Sarah: Biggest surprise was when the trainer said, 'Okay, it's time for sprints'. That in itself was not surprising but then he says we're going to do 4 sprints. I'm thinking, that's not so bad. He explains that the sprint is to the cone, which was between 40-50 yards away, and back (I am absolutely sure that I am not exaggerating on the distance). That was one sprint and we had to do 4, back to back, non-stop sprints. That's when I started to worry. Let's just say, I didn't see anybody sprinting by the end of it and most of us weren't sprinting at the start of it either. That really tested me. I remember just closing my eyes and trying to breathe while pushing through the last leg; and that little voice inside my head, the one that pops in from time to time and tries to convince me to stop doing what I'm doing -- well, that was getting pretty loud by the end of it. (laughs) I was happy to finish ahead of some of the other players though. SLUDGE: Any memorable moments at the Breeze tryout? Sarah: I had a few great plays in Mini (small field, 3v3). One was a D from behind and the other was a bookends play where i got up for a D in the opponents end-zone and then scored that same point. I think the size of the field in Mini really worked to my advantage because in Mini, it's really about those first few steps you need to get open, which was fairly easy for me to do, and to do so consistently. From there we switched to full field 3v3 though, and that was awful. I can be quick in the smaller games, but I am just not as fast as a lot of the guys that were out there so I would get beat on long throws and plays. It was expected but still a bummer. At the end of the tryout we switched to 7 on 7, full field scrimmages and things got better for me again. I would often get open for cuts underneath and I felt very involved in those points that I was on. SLUDGE: So, then, was this another "fun" tryout? Sarah: Absolutely. Not only did I enjoy most of the drills, but I had a few close friends at the tryout. I met a lot of really cool guys and made a few new friends so it was definitely a worthwhile experience. Playing Ultimate outside on a nice day and getting mini and full field scrimmages in was a great way to spend my afternoon and evening. SLUDGE: You previously mentioned about body soreness. How were you feeling after the Breeze tryout? Sarah: I was definitely sore but it wasn't nearly as bad as the way I had felt after the Current tryout. I had a bit more of a heads up about this tryout so I made sure to get workouts in leading up to it. I was definitely happy with my performances at both tryouts, they were really great experiences that left me feeling a little more confident in my overall play. However, I am sad to say that I felt slow out there with the guys, which is just a frustrating fact of life. (laughs) I'm normally on the faster side in women's so I had to adjust my strategy there a little bit. Q: So, what was the outcome of your tryout? 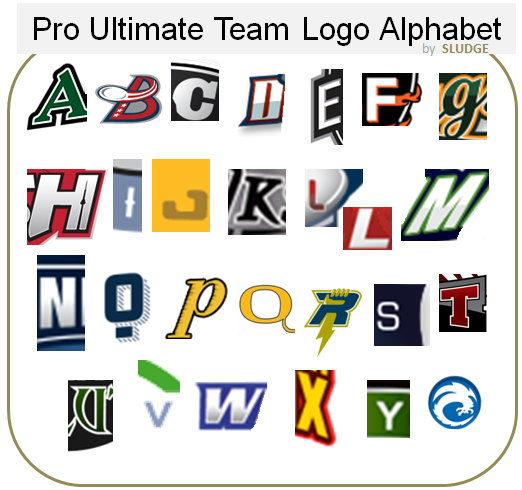 Can you guess all the pro Ultimate teams from their alphabet letter? 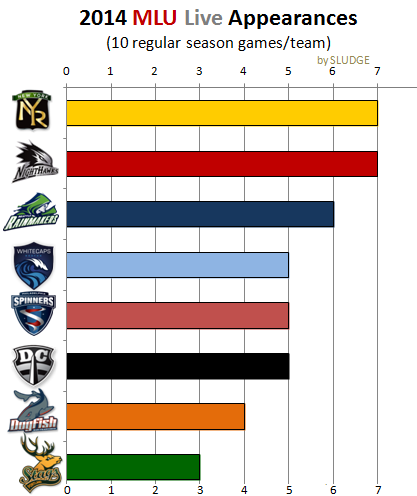 HINT: All 25 teams (AUDL, MLU) are represented, plus each of the league's logo. 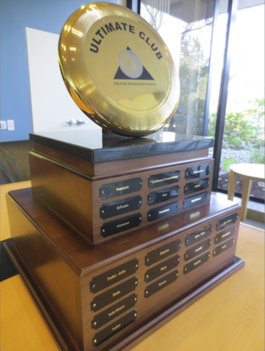 The "Ultimate Club" companion trophy at the DFJ headquarters in Menlo Park. "A soaring frisbee disk [sic] seems to defy the laws of gravity. We like that as a metaphor for DFJ-backed companies that create enormous market value. A golden frisbee signifies $1B and platinum one signals $10B of value created. We like the fact that frisbees are a cool, differentiated symbol (versus the boring lucite blocks we all have hidden in our drawers) that companies are proud to display prominently in their offices to inspire their teams. We showcase the Ultimate Club companion trophy in DFJ's office to inspire our new investments to think big and aim high." Parametric, Tumbleweed Communications, Soundview, GoTo.com, Kana, NetZero, Interwoven, Netcentives, Digital Impact, Tradex-Ariba, Selectica, Cyrus-Ciena, Focus Media, Baidu, Skype, EnerNOC, Athenahealth, Tesla Motors, Yammer, Solar City, Tumblr, Twitter. A documentary of Ultimate is being crowdfunded with hopes of helping to show the sport to a wider audience. SLUDGE just $upported this worthy flick project, which is seeking funds until April 11. 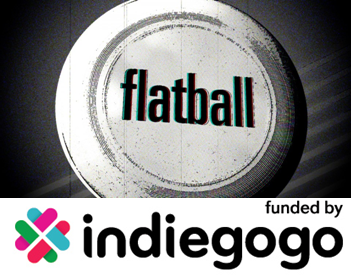 Info: Flatball: A History of Ultimate is a feature-length documentary that examines the sport's growing pains while celebrating ultimate's rich history and culture. Dennis Warsen, an Emmy Award winning documentary filmmaker (and USA Ultimate Hall of Fame player) is the force behind this project. His senior thesis from May 1990 was actually on the same topic. Contribute today toward the $30,000 goal. Many props to the Wind Chill for recognizing their players' club teams on the published roster. It's simple acts like this that could bridge the USAU-pro League divide. 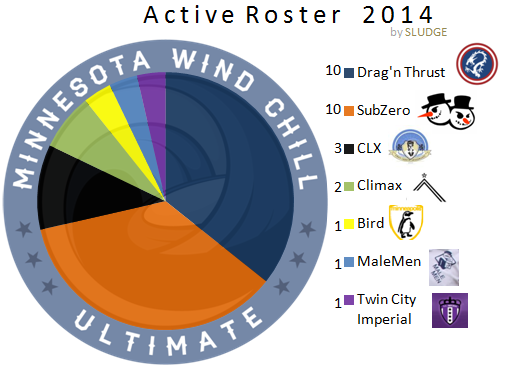 Nearly three-quarters (20, 71.4%) of Wind Chill's roster (28 active players) are from the club teams SubZero and 2013 Mixed Club Champions Drag'n Thrust. 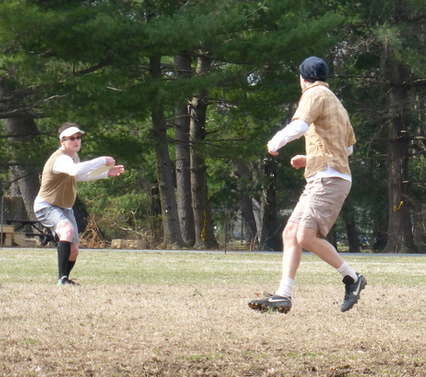 Sludge began their spring season like they have been here before - playing at the Reflection Reflecting Pool and starting a WAFC spring season for the 16th time. Sludge zone was good enough to create unforced repeated turnovers, which transitioned into unchallenged scoring opportunities. Up quickly with 5 straight breaks, CHarlie to Rachel; Henry to Charlie, Joe to Sarah, Matthew's bookends of a D'ing a floater and catch thrown by Sarah. The lone point Sludge gave up in the first half was when Russ was beaten deep during a person D point. Sludge led 8-1 at half. The second half continued with the fortunes of the first half. Sludge barely allowed 007 to advance the disc past midfield. Nigel backhand to Amy, 10-1; Michael to Rachel to Nigel to Matthew, 12-2; Russ missed a "callahanable" score, but caught and threw the score to Nigel, 13-2; David to Steve to Chris, 14-3. Sludge reeived the pull to start and kept the flow all the way down to the endzone with Andrew at the cone; 1-0. Sludge got the first break of the game at 3-1. A quick catch-and -throw point happened at 5-2 with Michael to Nigel to Bucci back to Nigel. At 6-5, Chris threw brown's 7th point. And Bucci led Sludge into half; 8-6. Sludge spaced the field well and cut when needed. The short gains of 10-15 yards powered the offense that benefited from winter pickup. Sludge played competitively and continued to lead 9-7, 11-8, 13-9. Sludge win 15-9. 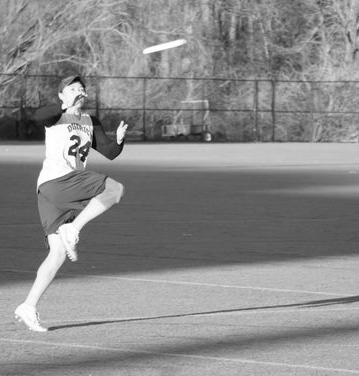 This local article about one of the local pro Ultimate drops some insight into Washington AUDL's pro Ultimate team, DC Breeze. Aaron Foreman said he came up with the name "the Breeze" because of the fluidity of the way the game is played. "It's fluid like a breeze," he said. "A breeze can also sneak up on you, and can even knock you down. That's how I came up with that name." Don Grage, an entrepreneur, said his initial financial investment into the team was only "in the low five figures" but said the time commitment was something he had to research and mull over before finally accepting co-ownership. Jonathon Neeley: "We are only paid $25 a game and expenses, so I'm not into it for the money, but it is pretty amazing to play in a professional league and having my travel expenses paid is huge. That in and of itself can be worth about $2,500 a season." Don Grage: "I want to create more awareness for it in the area and foster community interest. "Ultimate is an amazing and exciting spectator sport that is performed in a fun, family atmosphere. I'm not really in this for the money, but of course franchise values go up as people attend games. So come on out!" The Washington DC Current wore their dark uniforms for many of their 2013 games. Here's a side-by-side visual of the Current's lights and dark jerseys for the 2014 PUMA short sleeve jerseys (HOME and AWAY) compared to 2013's Five Ultimate 3/4 sleeve length jerseys. Woman: You mean that delicious scent of cherry blossoms? Man: No, I mean that Frisbee that just hit me in the back of the head. "USA Ultimate will not promote, partner with, or otherwise formally recognize or endorse the AUDL or MLU at this time." 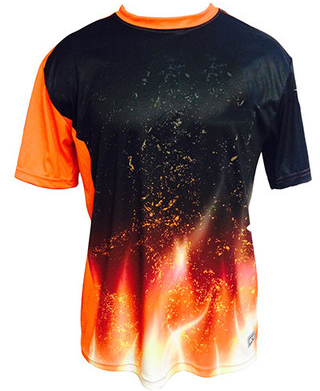 Match the AUDL team with this fiery flamed jersey. 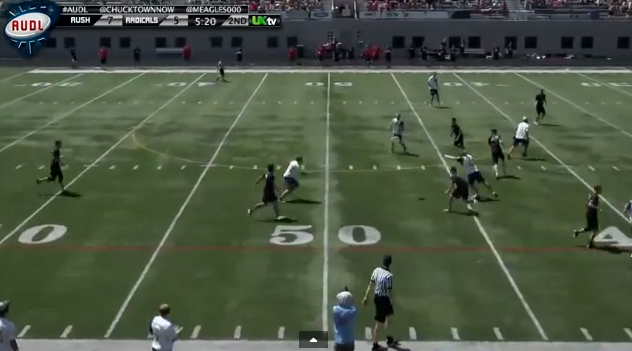 The growth of Ultimate is also expanding the opportunities to watch Ultimate games online. From a camera's perspective, playing Ultimate on a football/soccer field does not translate well. 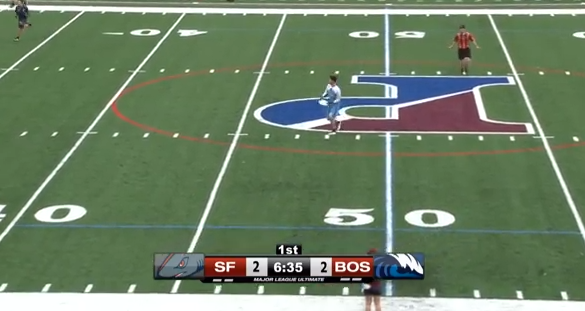 I'm not a fan of the endzones extending into the field, as mentioned before for the AUDL and MLU. 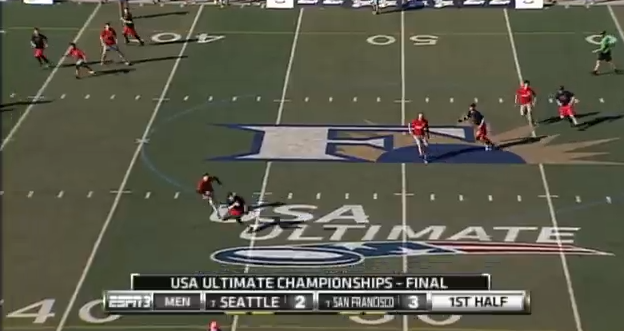 There's just too many markings on the field where Ultimate is being played. Ultimate is an uncomplicated game deserving of a more simplified field to showcase player athleticism and the disc. Here's an Ultimate field redesign to benefit viewers (who are new or experienced to the sport) plus players. 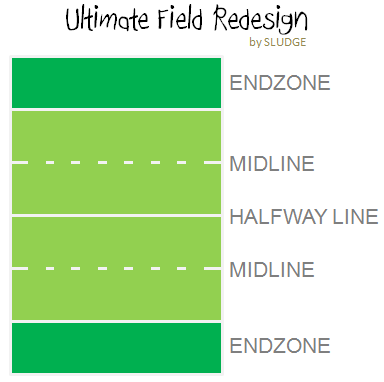 ENDZONES are a different color from the field to visually demonstrate differentiation from the field proper. The two dashed MIDLINES are positioned at the midpoint of each field half, signifying the red zone1 (an area where scoring most likely takes place). And, the solid HALFWAY LINE is in the middle of the entire field. One number (i.e. 35, 40) could be placed here to give a measurement of yardage. What would your ultimate Ultimate field look like? 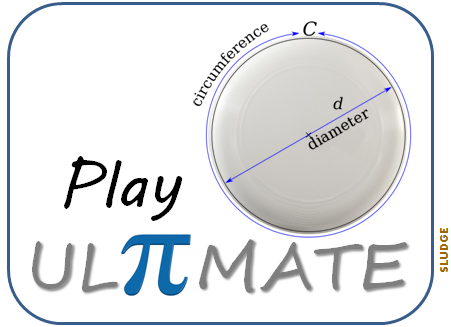 Today for Pi Day, you are encouraged to play Ultimate! Referee stripes*: A reminder that even though refs make calls in the pro Ultimate game, the "Integrity Rule" still gives the player the right to overturn a ref's call. 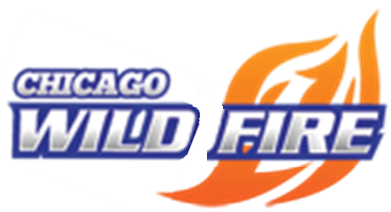 Logo: Use of the Wind Chill's alternate logo. Official state bird: 'Is that a loon?' may be an unusual question, but sometimes it must be asked. Look closely just below the numbers for the loon image. Minnesota boundary: The state's distinctive shape is a carryover from last year's jerseys. 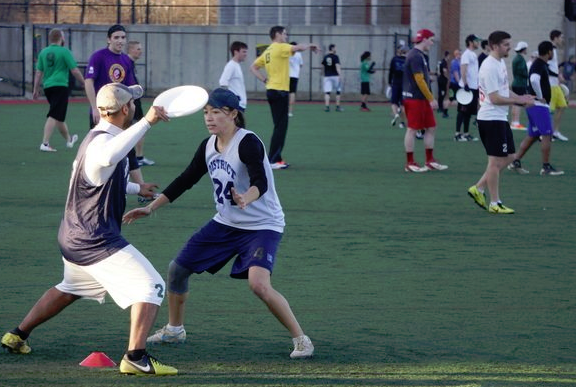 The pro Ultimate season begins in one month. Ultimate fans in Washington, DC - one of 6 cities with 2 teams - can start planning which local games to attend. There are a total of 12 scheduled home games in DC; 7 for DC Breeze (American Ultimate Disc League) + 5 for DC Current (Major League Ultimate). Twice, the teams play on the same day - May 4 and June 14. Both teams play a Philadelphia team on 5/4, and a New York team on 6/14. DC fans have an opportunity of an AUDL-MLU doubleheader on the 4th of May, but have to choose between the teams on the 14th of June. DC Breeze - opener at George Mason High School (Falls Church, VA); remainder of season at University of Maryland's Field Hockey & Lax Complex (College Park, MD). Venue. Buy tix. DC Current - Catholic University of America (DC). Venue. Buy tix. "Spatial Statistics to Evaluate Player Contribution in Ultimate" was presented by Jeremy Weiss and Sean Childers (Ultiworld Statistics editors) at the 8th annual MIT's Sloan Sports Analytics Conference (Feb 28-March 1). The paper is a statistician's dream! 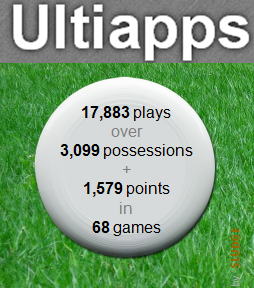 Using Ultimate stats application, Ultiapps, they impressively tracked 17,883 plays over 3099 possessions and 1579 points in 68 Ultimate games. Their analysis measures player contribution in the form of throws, completions, assists, scores, plus defense (blocks). Also, a sense of "best practices" for Ultimate offenses was determined, like it's better to dump-&-reset than to huck. From the paper: "The Hail Mary strategy, know in ultimate as Huck and D, is seen in all divisions of ultimate and particularly in poor weather conditions, but is less fun for players and unappealing to spectators. Figure 5 lends support to proponents in the ultimate community of shrinking the women's playing field and of postponing games in poor...conditions." 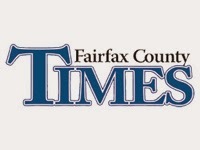 Screen grab from the paper. Existing statistical ultimate (Frisbee) analyses rely on summary statistics, such as completion percentage and scoring rate, to assess player strengths and weaknesses. However, these statistics are limited in their ability to evaluate a player's contribution to winning points; that is, two players of different value may look identical statistically. To better determine player contribution, we develop a spatially-aware measure. We collected data at elite tournaments using the using the UltiApps iPad application that tracks thrower and receiver locations and point outcomes. Using the location-based data, we produce team-specific and aggregate scoring probability graphs using logistic regression, LOESS, and k-nearest neighbors models. Overlaying each play on the graph determines an attributable contribution, i.e. the change in scoring probability, which is assigned to each involved player. Averaging over all points yields a player's Expected Contribution. Our measure reliably distinguishes the best throwers, receivers, and defenders in both men's and women's divisions. The Expected Contribution measure combines these factors to produce an assessment of players that accounts for their strengths and weaknesses in each phase of the game. As a secondary outcome, the scoring probability graphs can be also be used to compare the effectiveness of strategies, such as punts versus possession and risk-seeking (high variance throws) versus risk-averse. Dates for favorite local Ultimate tournament for club teams - Chesapeake - have been scheduled. The Chesapeake Invite will take place earlier, in July, as a USA Ultimate Triple Crown Tour event, while the Chesapeake Open will be normally held early August in Poolesville. 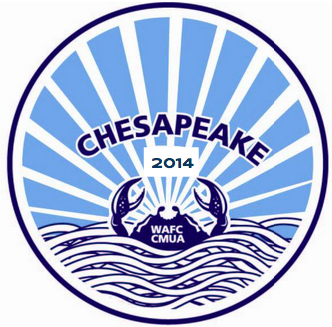 2014 will mark the 10th consecutive year for Chesapeake. 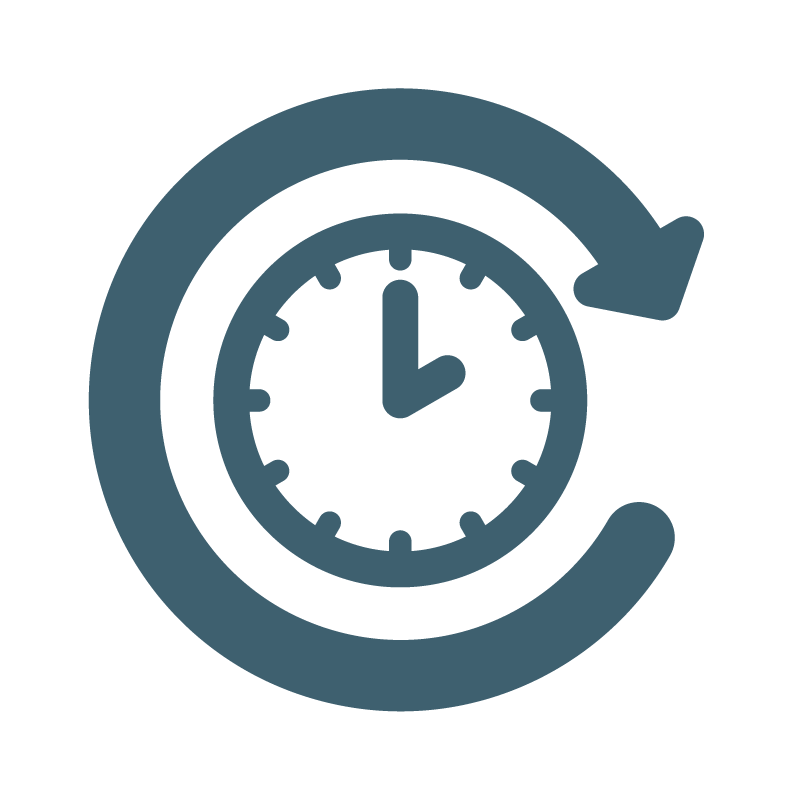 At which time, you lose one hour of sleep forward your clock one hour ahead. Alternatively, you may also set your clocks ahead prior to slumber. Your choice on how to obey the ENERGY POLICY ACT OF 2005 (an act to ensure jobs for our future with secure, affordable, and reliable energy). Expect more Ultimate pickup game(s) to be available in the evening hours. Fourteen years ago, UPA (now USA Ultimate) considered the idea of a pro league for the sport of Ultimate -- it wasn't the first, and it probably won't be the last. Reading the past newsletters, there's a sense of cordial relationship between the parties; unlike the MLU's tiff with USAU. PUL will maintain the ideals of Ultimate: spirit, competition, and camaraderie, while increasing the game's level of organization, competition and professionalism. Mixed teams (women and men) will compete on the same field. 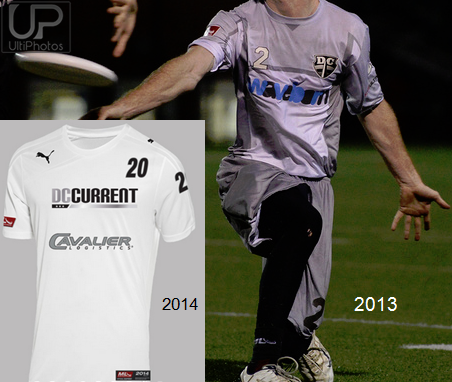 PUL will mediate the intense competition of Ultimate the sport and preserve the joy of playing Ultimate the game. 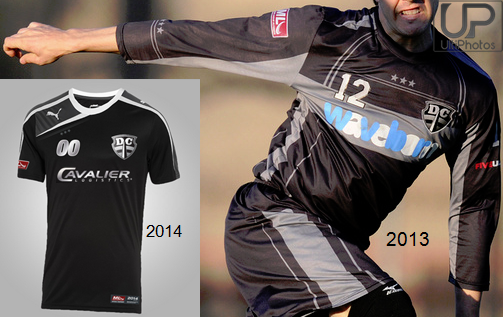 PUL is a complement to UPA-sponsored and local Ultimate leagues. PUL profits will be allocated to the growth and development of Ultimate through the construction of facilities, support of Ultimate Festivals, the development of high school and college Ultimate programs, advertising, and donations to the UPA. General Managers, coaches, and key players will be full-time employees of the PUL. They will teach Ultimate through high school, college, and community seminars in the off-season as well as participate in other ultimate events locally and nationally. 2001: PUL presentation to the UPA board. 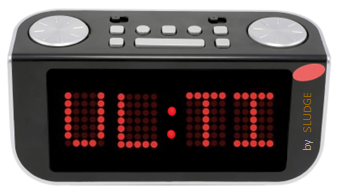 2002: Host 3 demonstration tournaments to illustrate the appeal and marketability of Professional Ultimate and showcase the sport to potential corporate sponsors. 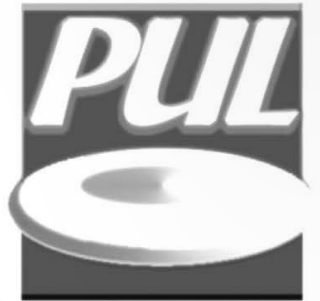 2003: Begin first season of PUL. 1) An increased level of competition and strategy. 2) One set of rules and rule calling; no extended debates about bad calls, and there will be sideline observers to eliminate questionable calls. 3) Players will earn fortune and fame. 4) Help form the foundation of the future of Ultimate. In the same newsletter issue, UPA's Executive Director, Joey Gray, reacts cautiously optimistic toward the PUL idea. In her own words, "Not the first with the idea of a pro league, Steve comes at it from a unique perspective. So far, I am impressed with his thoughtfulness, follow-through, patience and his ability to ask for and integrate a wide range of constructive suggestions." "I think it will be important, sooner or later, to work toward a player-friendly and long-lived pro Ultimate league. It should well integrated with other Ultimate activities and organizations..."
"Will the PUL go the way of the 3 other pro league proposals that have come to the the UPA attention over the years, or will this be THE one? Who knows! Equally important as a solid business plan and player/organizer buy-in if of course the money." 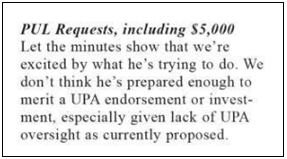 In the next UPA newsletter issue, the board meeting recap reported support was not approved for PUL. Read the full article from the UPA newsletter. 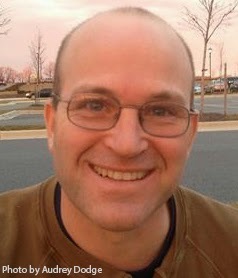 Read an interview with Steve Dodge from March 2014. MLU's weekly podcast, Cleats & Cufflinks, takes to the EARairwaves to criticize USA Ultimate, the National Governing Body for the sport of Ultimate in the U.S. A comparison chart is used to fuel the discussion "disgust-ion" (?) about USAU operations and the belittling of Dr. Tom Crawford. 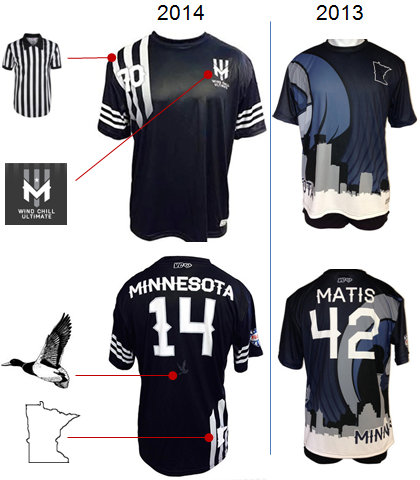 Last week, USAU scheduled an east coast Triple Crown Tour event on the same weekend as the MLU Championships - July 12. This scheduling conflict most likely impacts elite club team players who are also rostered on an MLU squad. For example, if the DC Current appear in the MLU Championships, then a healthy portion of DC's Truck Stop roster would be impacted. So, MLU (Jeff Snader & Nic Darling) ain't happy with USA Ultimate. Original copy of Sludge's first season schedule. The New York Empire's well-designed logo will be fashioned on their excellently designed away jerseys for the 2014 AUDL season. 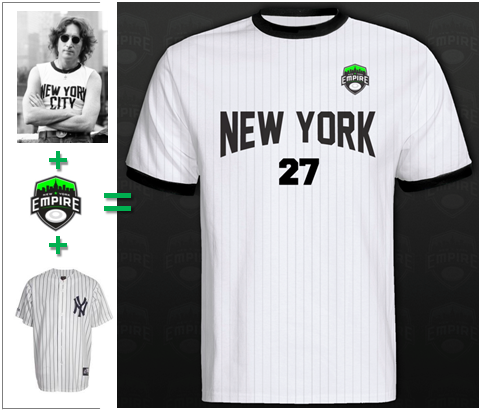 The iconic imagery of New York of John Lennon's NYC t-shirt and Yankee pinstripes are beautifully balanced on this white Ultimate jersey. UPDATE: New York Empire corrects the equation to include New York Cosmos. 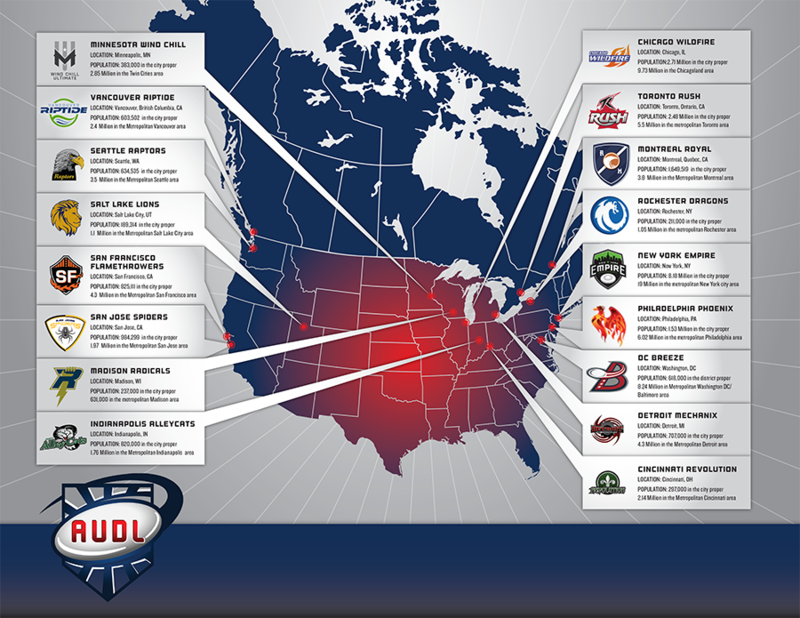 American Ultimate Disc League published a line-saturated map promoting their professional Ultimate teams. 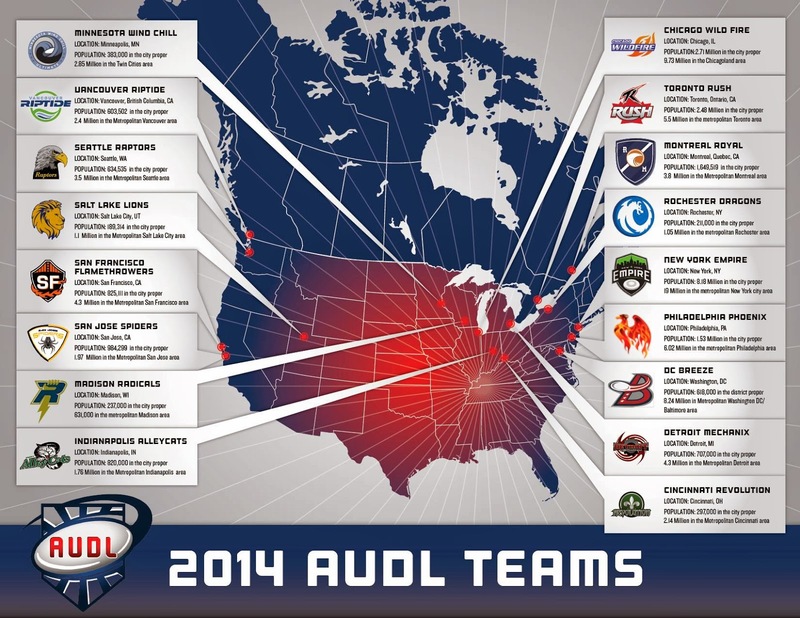 The '2014 AUDL Teams' map shows all 17 teams, including the 5 teams in the west, 3 Canadian teams, and 2 teams in New York state. 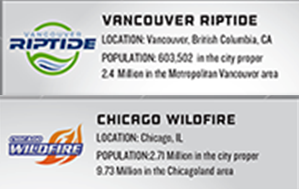 Should be Chicago 'Wildfire', not "Wild Fire"
Riptide's city should be spelled starting with a 'V', not "U" with a better chosen font so it looks like a "V"
UPDATED 4/8/2014: A revised map is now being used online by the AUDL with corrections in the Vancouver font choice and Wildfire's spacing.